In what may prove to be a groundbreaking first for more to come, WayForward Technologies has announced an upcoming game that’s compatible with the Apple Watch. 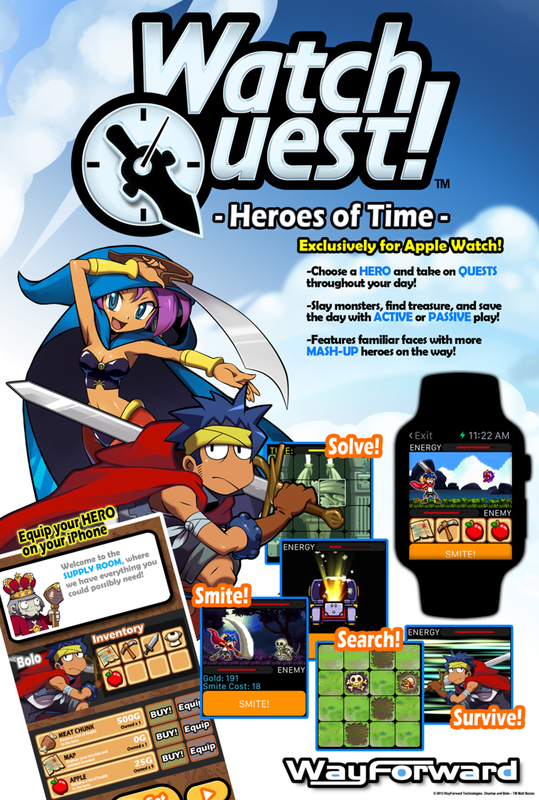 Watch Quest! : Heroes of Time, while playable across both the Apple Watch and the iPhone, is the first adventure-style game to run on Apple’s flagship wearable, and will be available for download on the same day the Apple Watch hits shelves, April 24th. Watch Quest!, a free download that comes with a training quest, will also allow players to pay for missions and additional characters in the form of Quest Packs, fitting in to the already established mobile gaming market. According to announcement poster, players will be able to “slay monsters, find treasure, and save the day with Active and Passive play,” indicating some system that implements background operation. As mentioned above, Watch Quest! : Heroes of Time launches for free on April 24th, the same day the Apple Watch goes public (not for free – $350-$1000). Great to see more Apple Watch games being announced. Adventure category, RPG category, and we’re covering the casual sports/cards/matching/etc categories. Can’t wait to play them all!